It is suggested that rather than purchase materials, you simply gather whatever you can find around your program. Traditionally, these Ring and Pin games were created by Native American children and adults using whatever they had available to them. If you do the same, it will provide a much more interesting basis for discussion about the activity and its cultural context. If you have no craft sticks, maybe pencils, chopsticks or even sticks from outside might do (make sure pencils are NOT sharpened). The rings can come in many forms (see below). Challenge the children to come up with their own creative designs based on what is available to them. Because this game has been widely played across many cultures, there are countless different materials and basic ways of playing. 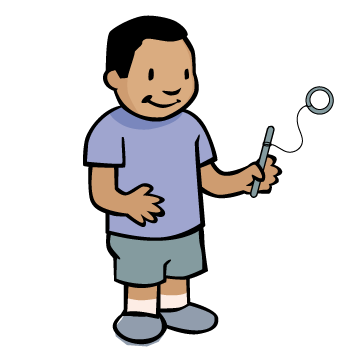 The general idea of all of these games is that the player holds a stick with a cord or string attached to it, and a ring, several rings, or some other target fastened to the other end of the cord. 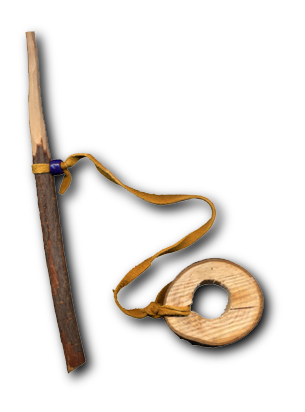 The ring or target is thrown into the air, and the player attempts to spear it with the stick or “pin” at the other end of the cord. See Suggestions (in the “Make it Better” step) for information about different materials used in different Nations. Here are three examples of different games: This game (Figure 1) is carved from wood. 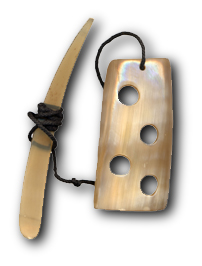 This game (Figure 2) is made from cow horn, and you can see that there are 4 holes that the player can spear. 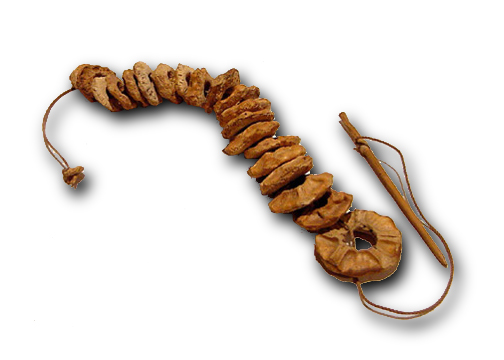 And this game (Figure 3) is made from a stick and dried pieces of squash. 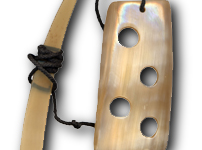 As you can see there are MANY rings in this game—the object is to spear or catch as many rings as possible. Ask your students what kinds of games they like to play. Do these games teach them anything? What sorts of skills do they learn? Tell them that today they are going to learn how to make a game that children in Native American tribes all across North America have been making and playing for a long time. Children who are Native American play all of the same kinds of games that your children listed—video games, board games, card games, etc. But there are also games that have been played by their families and their culture for hundreds of years (and maybe longer!). One of these games is called “Ring and Pin”, and it is designed to be fun and also to teach children eye-hand coordination. Make your own game out of the materials you have in your afterschool program, and play a kind of game that Native American children from some tribes all across North America used to play! While doing this activity, you may have the opportunity to talk about Native cultures, particularly if you live in an area that has Native Americans in your community. It is important to impress upon children that while Native cultures have a long and rich history, Native people are still very much around, doing all the same sorts of things that everyone does. But they are also very proud of their traditions and heritage, and they try to raise their children to be aware and proud as well. See the letter in Suggestions (in the “Make it Better” step)—it was written by a woman from the Wampanoag tribe in Massachusetts just for educators around the country, and it offers a Native perspective on teaching about Native cultures. Children should work in small teams on this activity, but each child should create their own ring and pin game. If you have made one ahead of time, show your ring and pin game to the children and show them how you play. Show them the pictures above too, and tell them that there are countless ways to make a game…and that their challenge is to create their own. Show your students the materials you have provided for them, and set them to work. After students have spent 15-20 minutes experimenting with the materials, bring them together to talk about what they have discovered. What kinds of ring and pin games are they trying to make (one ring, many rings, or a “target”)? Do some materials work better than others? If you provided different kinds of string, do some strings work better than others? If not mentioned, ask them if the weight of the “ring”, target or rings makes a difference. How about the length of the stick? How easy or difficult should their game be? If it is impossible to do, is it much fun? What if it is too easy to play? Have students return to complete their games, then bring them all together to show off what they created, and take turns playing each others’ games. 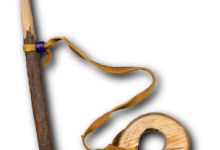 Tribes from across North America use different materials to make their games, particularly to make the “ring” or target. The Penobscot in Maine used a piece of leather for their ring. The Mohave in Arizona used slices of squash. The Montagnais from Quebec, Canada carved caribou toe bones. The Paiute, who come from Nevada used a rabbit skull. The Narragansett in Rhode Island carved a piece of wood. The Karok from Northern California used dried salmon vertebra. The Digueno from Southern California used acorn caps. Klamath people in Washington used salmon bones. The Sioux used deer toe bones. “The Wampanoag people are alive and well. We still have our spiritual ceremonies and dances and songs and languages. We have our regalia in which we dress ourselves for celebrations in the manner of our ancestors. We raise our children to be proud of their culture.